Don’t have a free account? Sign up now! 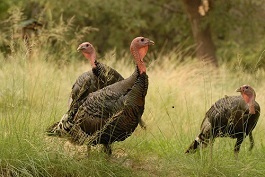 PHOENIX – Hunters who have an AZGFD portal account now can view their draw results for the 2018 spring turkey, javelina, bison and bear seasons. Simply log into your account, and you will be taken to your personal ‘My AZ Outdoors” page. A portal account provides VIP access to draw results up to a week before results are released to the general public. It’s quick, easy and free to create a portal account. Visit https://www.azgfd.com/Account/Register and just fill in the required fields. A portal account offers hunters a secure way to manage and view their contact information, as well as license details, draw results and bonus points, in their personal “My AZ Outdoors” section. It’s also mobile-friendly, which means customers can view their information on their smartphone. Meanwhile, the department will post an announcement on its website when results officially are released. All permit-tags are anticipated to be mailed by Dec. 13; all refund warrants by Dec. 1. For more information, call the department at (602) 942-3000.